Hyperthermia is elevated body temperature due to failed thermoregulation that occurs when a body produces or absorbs more heat than it dissipates. Extreme temperature elevation then becomes a medical emergency requiring immediate treatment to prevent disability or death. The most common causes include heat stroke and adverse reactions to drugs. The former is an acute temperature elevation caused by exposure to excessive heat, or combination of heat and humidity, that overwhelms the heat-regulating mechanisms. The latter is a relatively rare side effect of many drugs, particularly those that affect the central nervous system. Malignant hyperthermia is a rare complication of some types of general anesthesia. Hyperthermia differs from fever in that the body's temperature set point remains unchanged. The opposite is hypothermia, which occurs when the temperature drops below that required to maintain normal metabolism. Note: The difference between fever and hyperthermia is the underlying mechanism. Different sources have different cut-offs for fever, hyperthermia and hyperpyrexia. In humans, hyperthermia is defined as a temperature greater than 37.5–38.3 °C (99.5–100.9 °F), depending on the reference used, that occurs without a change in the body's temperature set point. The normal human body temperature can be as high as 37.7 °C (99.9 °F) in the late afternoon. Hyperthermia requires an elevation from the temperature that would otherwise be expected. Such elevations range from mild to extreme; body temperatures above 40 °C (104 °F) can be life-threatening. An early stage of hyperthermia can be "heat exhaustion" (or "heat prostration" or "heat stress"), whose symptoms include heavy sweating, rapid breathing and a fast, weak pulse. If the condition progresses to heat stroke, then hot, dry, skin is typical as blood vessels dilate in an attempt to increase heat loss. An inability to cool the body through perspiration may cause the skin to feel dry. Other signs and symptoms vary. Accompanying dehydration can produce nausea, vomiting, headaches, and low blood pressure and the latter can lead to fainting or dizziness, especially if the standing position is assumed quickly. In severe heat stroke, there may be confused, hostile, or seemingly intoxicated behavior. Heart rate and respiration rate will increase (tachycardia and tachypnea) as blood pressure drops and the heart attempts to maintain adequate circulation. The decrease in blood pressure can then cause blood vessels to contract reflexly, resulting in a pale or bluish skin color in advanced cases. Young children, in particular, may have seizures. Eventually, organ failure, unconsciousness and death will result. Heat stroke occurs when thermoregulation is overwhelmed by a combination of excessive metabolic production of heat (exertion), excessive environmental heat, and insufficient or impaired heat loss, resulting in an abnormally high body temperature. In severe cases, temperatures can exceed 40 °C (104 °F). Heat stroke may be non-exertional (classic) or exertional. Significant physical exertion in hot conditions can generate heat beyond the ability to cool, because, in addition to the heat, humidity of the environment may reduce the efficiency of the body's normal cooling mechanisms. Human heat-loss mechanisms are limited primarily to sweating (which dissipates heat by evaporation, assuming sufficiently low humidity) and vasodilation of skin vessels (which dissipates heat by convection proportional to the temperature difference between the body and its surroundings, according to Newton's law of cooling). Other factors, such as insufficient water intake, consuming alcohol, or lack of air conditioning, can worsen the problem. The increase in body temperature that results from a breakdown in thermoregulation affects the body biochemically. Enzymes involved in metabolic pathways within the body such as cellular respiration fail to work effectively at higher temperatures, and further increases can lead them to denature, reducing their ability to catalyse essential chemical reactions. This loss of enzymatic control affects the functioning of major organs with high energy demands such as the heart and brain. Situational heat stroke occurs in the absence of exertion. It mostly affects the young and elderly. In the elderly in particular, it can be precipitated by medications that reduce vasodilation and sweating, such as anticholinergic drugs, antihistamines, and diuretics. In this situation, the body's tolerance for high environmental temperature may be insufficient, even at rest. Heat waves are often followed by a rise in the death rate, and these 'classical hyperthermia' deaths typically involve the elderly and infirm. This is partly because thermoregulation involves cardiovascular, respiratory and renal systems which may be inadequate for the additional stress because of the existing burden of aging and disease, further compromised by medications. During the July 1995 heat wave in Chicago, there were at least 700 heat-related deaths. The strongest risk factors were being confined to bed, and living alone, while the risk was reduced for those with working air conditioners and those with access to transportation. Even then, reported deaths may be underestimates as diagnosis can be misclassified as stroke or heart attack. Some drugs cause excessive internal heat production. The rate of drug-induced hyperthermia is higher where use of these drugs is higher. Many psychotropic medications, such as selective serotonin reuptake inhibitors (SSRIs), monoamine oxidase inhibitors (MAOIs), and tricyclic antidepressants, can cause hyperthermia. Serotonin syndrome is a rare adverse reaction to overdose of these medications or the use of several simultaneously. Similarly, neuroleptic malignant syndrome is an uncommon reaction to neuroleptic agents. These syndromes are differentiated by other associated symptoms, such as tremor in serotonin syndrome and "lead-pipe" muscle rigidity in neuroleptic malignant syndrome. Various stimulant drugs, including amphetamines, cocaine, PCP, LSD, and MDMA can produce hyperthermia as an adverse effect. Malignant hyperthermia is a rare reaction to common anesthetic agents (such as halothane) or the paralytic agent succinylcholine. Those who have this reaction, which is potentially fatal, have a genetic predisposition. The use of anticholinergics, more specifically muscarinic antagonists are thought to cause mild hyperthermic episodes due to its parasympatholytic effects. The sympathetic nervous system a.k.a. the "Fight or Flight Response" dominates by raising catecholamine levels by the blocked action of the Rest and Digest System. Drugs that decouple oxidative phosphorylation may also cause hyperthermia. From this group of drugs the most well known is 2,4-Dinitrophenol which was used as a weight loss drug until dangers from its use became apparent. Those working in industry, in the military, or as first responders may be required to wear personal protective equipment (PPE) against hazards such as chemical agents, gases, fire, small arms and even Improvised Explosive Devices (IEDs). PPE includes a range of hazmat suits, firefighting turnout gear, body armor and bomb suits, among others. Depending on design, the wearer may be encapsulated in a microclimate, due to an increase in thermal resistance and decrease in vapor permeability. As physical work is performed, the body’s natural thermoregulation (i.e., sweating) becomes ineffective. This is compounded by increased work rates, high ambient temperature and humidity levels, and direct exposure to the sun. The net effect is that desired protection from some environmental threats inadvertently increases the threat of heat stress. The effect of PPE on hyperthermia has been noted in fighting the 2014 Ebola virus epidemic in Western Africa. Doctors and healthcare workers were only able to work 40 minutes at a stretch in their protective suits, fearing heat strokes. Other rare causes of hyperthermia include thyrotoxicosis and an adrenal gland tumor, called pheochromocytoma, both of which can cause increased heat production. Damage to the central nervous system, from brain hemorrhage, status epilepticus, and other kinds of injury to the hypothalamus can also cause hyperthermia. A summary of the differences between hyperthermia, hypothermia, and fever. Hyperthermia: Characterized on the left. Normal body temperature (thermoregulatory set-point) is shown in green, while the hyperthermic temperature is shown in red. As can be seen, hyperthermia can be conceptualized as an increase above the thermoregulatory set-point. Hypothermia: Characterized in the center: Normal body temperature is shown in green, while hypothermic temperature is shown in blue. As can be seen, hypothermia can be conceptualized as a decrease below the thermoregulatory set-point. Fever: Characterized on the right: Normal body temperature is shown in green. It reads "New Normal" because the thermoregulatory set-point has risen. This has caused what was the normal body temperature (in blue) to be considered hypothermic. A fever occurs when the core temperature is set higher, through the action of the pre-optic region of the anterior hypothalamus. For example, in response to a bacterial or viral infection, certain white blood cells within the blood will release pyrogens which have a direct effect on the anterior hypothalamus, causing body temperature to rise, much like raising the temperature setting on a thermostat. In contrast, hyperthermia occurs when the body temperature rises without a change in the heat control centers. Some of the gastrointestinal symptoms of acute exertional heat stroke, such as vomiting, diarrhea, and gastrointestinal bleeding, may be caused by barrier dysfunction and subsequent endotoxemia. Ultraendurance athletes have been found to have significantly increased plasma endotoxin levels. Endotoxin stimulates many inflammatory cytokines, which in turn may cause multiorgan dysfunction. Experimentally, monkeys treated with oral antibiotics prior to induction of heat stroke do not become endotoxemic. There is scientific support for the concept of a temperature set point - that is, maintenance of an optimal temperature for the metabolic processes that life depends on. Nervous activity in the preoptic-anterior hypothalamus of the brain triggers heat losing (sweating, etc.) or heat generating (shivering and muscle contraction, etc.) activities through stimulation of the autonomic nervous system. The pre-optic anterior hypothalamus has been shown to contain warm sensitive, cool sensitive, and temperature insensitive neurons, to determine the body's temperature setpoint. As the temperature that these neurons are exposed to rises above 37 °C, the rate of electrical discharge of the warm-sensitive neurons increases progressively. Cold-sensitive neurons increase their rate of electrical discharge progressively below 37 °C. Hyperthermia is generally diagnosed by the combination of unexpectedly high body temperature and a history that supports hyperthermia instead of a fever. Most commonly this means that the elevated temperature has occurred in a hot, humid environment (heat stroke) or in someone taking a drug for which hyperthermia is a known side effect (drug-induced hyperthermia). The presence of signs and symptoms related to hyperthermia syndromes, such as extrapyramidal symptoms characteristic of neuroleptic malignant syndrome, and the absence of signs and symptoms more commonly related to infection-related fevers, are also considered in making the diagnosis. If fever-reducing drugs lower the body temperature, even if the temperature does not return entirely to normal, then hyperthermia is excluded. A sustained wet-bulb temperature exceeding 35 °C is likely to be fatal even to fit and healthy people unclothed in the shade next to a fan; at this temperature, environmental heat gain instead of loss occurs. As of 2012, wet-bulb temperatures only very rarely exceeded 30 °C anywhere, although significant global warming may change this. In cases of heat stress caused by physical exertion, hot environments, or protective equipment, prevention or mitigation by frequent rest breaks, careful hydration, and monitoring body temperature should be attempted. However, in situations demanding one is exposed to a hot environment for a prolonged period or must wear protective equipment, a personal cooling system is required as a matter of health and safety. There is a variety of active or passive personal cooling systems; these can be categorized by their power sources and whether they are person- or vehicle-mounted. Because of the broad variety of operating conditions, these devices must meet specific requirements concerning their rate and duration of cooling, their power source, and their adherence to health and safety regulations. Among other criteria are the user's need for physical mobility and autonomy. For example, active-liquid systems operate by chilling water and circulating it through a garment; the skin surface area is thereby cooled through conduction. This type of system has proven successful in certain military, law enforcement, and industrial applications. Bomb-disposal technicians wearing special suits to protect against improvised explosive devices (IEDs) use a small, ice-based chiller unit that is strapped to one leg; a liquid-circulating garment, usually a vest, is worn over the torso to maintain a safe core body temperature. By contrast, soldiers traveling in combat vehicles can face microclimate temperatures in excess of 65 °C and require a multiple-user, vehicle-powered cooling system with rapid connection capabilities. Requirements for hazmat teams, the medical community, and workers in heavy industry vary further. The underlying cause must be removed. Mild hyperthemia caused by exertion on a hot day may be adequately treated through self-care measures, such as increased water consumption and resting in a cool place. Hyperthermia that results from drug exposure requires prompt cessation of that drug, and occasionally the use of other drugs as counter measures. Antipyretics (e.g., acetaminophen, aspirin, other nonsteroidal anti-inflammatory drugs) have no role in the treatment of heatstroke because antipyretics interrupt the change in the hypothalamic set point caused by pyrogens; they are not expected to work on a healthy hypothalamus that has been overloaded, as in the case of heatstroke. In this situation, antipyretics actually may be harmful in patients who develop hepatic, hematologic, and renal complications because they may aggravate bleeding tendencies. When body temperature is significantly elevated, mechanical cooling methods are used to remove heat and to restore the body's ability to regulate its own temperatures. Passive cooling techniques, such as resting in a cool, shady area and removing clothing can be applied immediately. Active cooling methods, such as sponging the head, neck, and trunk with cool water, remove heat from the body and thereby speed the body's return to normal temperatures. Drinking water and turning a fan or dehumidifying air conditioning unit on the affected person may improve the effectiveness of the body's evaporative cooling mechanisms (sweating). Sitting in a bathtub of tepid or cool water (immersion method) can remove a significant amount of heat in a relatively short period of time. It was once thought that immersion in very cold water is counterproductive, as it causes vasoconstriction in the skin and thereby prevents heat from escaping the body core. However, a British analysis of various studies stated: "this has never been proven experimentally. Indeed, a recent study using normal volunteers has shown that cooling rates were fastest when the coldest water was used." The analysis concluded that cool water immersion is the most-effective cooling technique for exertional heat stroke. No superior cooling method has been found for non-exertional heat stroke. Thus, aggressive ice-water immersion remains the gold standard for life-threatening heat stroke. When the body temperature reaches about 40 °C, or if the affected person is unconscious or showing signs of confusion, hyperthermia is considered a medical emergency that requires treatment in a proper medical facility. In a hospital, more aggressive cooling measures are available, including intravenous hydration, gastric lavage with iced saline, and even hemodialysis to cool the blood. The frequency of environmental hyperthermia can vary significantly from year to year depending on factors such as heat waves. Statistically, outdoor workers, including agricultural workers, are at increased risk of experiencing heat stress and the resulting negative health effects. Between 1992 and 2006 in the United States, 68 crop workers died from heat stroke, representing a rate 20 times that of US civilian workers overall. In India, hundreds die every year from summer heat waves, including more than 2,500 in the year 2015. Later that same summer, the 2015 Pakistani heat wave killed about 2,000 people. An extreme 2003 European heat wave caused tens of thousands of deaths. Hyperthermia can also be deliberately induced using drugs or medical devices and is being studied and applied in clinical routine as a treatment of some kinds of cancer. ↑ Marx, John (2006). Rosen's emergency medicine: concepts and clinical practice. Mosby/Elsevier. p. 2239. ISBN 978-0-323-02845-5. ↑ Karakitsos D, Karabinis A (September 2008). "Hypothermia therapy after traumatic brain injury in children". N. Engl. J. Med. 359 (11): 1179–80. doi:10.1056/NEJMc081418. PMID 18788094. 1 2 3 Axelrod YK, Diringer MN (May 2008). "Temperature management in acute neurologic disorders". Neurol. Clin. 26 (2): 585–603, xi. doi:10.1016/j.ncl.2008.02.005. PMID 18514828. 1 2 3 Laupland KB (July 2009). "Fever in the critically ill medical patient". Crit. Care Med. 37 (7 Suppl): S273–8. doi:10.1097/CCM.0b013e3181aa6117. PMID 19535958. ↑ Sharma HS, ed. (2007). Neurobiology of Hyperthermia (1st ed.). Elsevier. pp. 175–177, 485. ISBN 9780080549996. Retrieved 19 November 2016. Despite the myriad of complications associated with heat illness, an elevation of core temperature above 41.0°C (often referred to as fever or hyperpyrexia) is the most widely recognized symptom of this syndrome. 1 2 3 4 5 6 7 8 9 10 11 12 13 14 15 16 17 Fauci, Anthony; et al. (2008). Harrison's Principles of Internal Medicine (17th ed.). McGraw-Hill Professional. pp. 117–121. ISBN 978-0-07-146633-2. ↑ Tintinalli, Judith (2004). Emergency Medicine: A Comprehensive Study Guide, Sixth edition. McGraw-Hill Professional. p. 1187. ISBN 0-07-138875-3. ↑ Semenza JC, Rubin CH, Falter KH, Selanikio JD, Flanders WD, Howe HL, Wilhelm JL (July 1996). 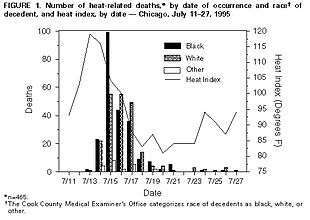 "Heat-related deaths during the July 1995 heat wave in Chicago". N Engl J Med. 335 (2): 84–90. doi:10.1056/NEJM199607113350203. PMID 8649494. ↑ Tintinalli, Judith (2004). Emergency Medicine: A Comprehensive Study Guide, Sixth edition. McGraw-Hill Professional. p. 1818. ISBN 0-07-138875-3. ↑ Marx, John (2006). Rosen's emergency medicine: concepts and clinical practice. Mosby/Elsevier. p. 2894. ISBN 978-0-323-02845-5. ↑ Marx, John (2006). Rosen's emergency medicine: concepts and clinical practice. Mosby/Elsevier. p. 2388. ISBN 978-0-323-02845-5. ↑ Patel, R.J.; et al. (January 2004). "Prevalence of autonomic signs and symptoms in antimuscarinic drug poisonings". J. Emerg. Med. 26 (1). pp. 89–94. 1 2 "Microclimate Conditioning Systems" (PDF). US Army Natick Soldier RD&E Center. May 2007. Retrieved 2 August 2015. ↑ Northam, Jackie (7 October 2014). "Ebola Protective Suits Are In Short Supply". National Public Radio. Retrieved 21 January 2015. ↑ Byrne, J.H. "Neuroscience Online: An Electronic Textbook for the Neurosciences". Department of Neurobiology and Anatomy, The University of Texas Medical School at Houston (UTHealth). Retrieved 13 January 2013. ↑ Muir, Hazel (23 October 2010). "Thermogeddon: Too hot for humans". New Scientist. 208 (2783): 36–39. doi:10.1016/S0262-4079(10)62649-8. ↑ "NIOSH Workplace Safety and Health Topics: Heat Stress". National Institute for Occupational Safety and Health. Retrieved 21 March 2014. 1 2 Smith, J E (2005). "Cooling methods used in the treatment of exertional heat illness". British Journal of Sports Medicine. 39 (8): 503–7; discussion 507. doi:10.1136/bjsm.2004.013466. PMC 1725271 . PMID 16046331. ↑ Bouchama, Abderrezak; Dehbi, Mohammed; Chaves-Carballo, Enrique (2007). "Cooling and hemodynamic management in heatstroke: practical recommendations". Critical Care. 11 (3): R54. doi:10.1186/cc5910. PMC 2206402 . PMID 17498312. ↑ McDermott, Brendon P.; Casa, Douglas J.; Ganio, Matthew S.; Lopez, Rebecca M.; Yeargin, Susan W.; Armstrong, Lawrence E.; Maresh, Carl M. (2009). "Acute Whole-Body Cooling for Exercise-Induced Hyperthermia: A Systematic Review". Journal of Athletic Training. 44 (1): 84–93. doi:10.4085/1062-6050-44.1.84. PMC 2629045 . PMID 19180223. ↑ "Heat-Related Deaths Among Crop Workers – United States, 1992–2006". Morbidity and Mortality Weekly Report. Centers for Disease Control and Prevention. 57 (24): 649–653. 20 June 2008. Retrieved 21 March 2014. ↑ Mallapur, Chaitanya (27 May 2015). "61% Rise In Heat-Stroke Deaths Over Decade". IndiaSpend. Retrieved 26 June 2015. ↑ "India heatwave: death toll passes 2,500 as victim families fight for compensation". Reuters. 2 June 2015. Retrieved 26 June 2015. ↑ Haider, Kamran; Anis, Khurrum (24 June 2015). "Heat Wave Death Toll Rises to 2,000 in Pakistan's Financial Hub". Bloomberg News. Retrieved 3 August 2015. ↑ Robine, Jean-Marie; et al. (February 2008). "Death toll exceeded 70,000 in Europe during the summer of 2003". Comptes Rendus Biologies. 331 (2): 171–178. doi:10.1016/j.crvi.2007.12.001. ISSN 1631-0691. PMID 18241810. ↑ National Cancer Institute (31 August 2011). "Hyperthermia in Cancer Treatment". Retrieved 2 August 2015.